"That boy John, wandering God knows where, had come back to his mother's death bed and his father's death bed. Now, his sister Sarah is in the hospital. Not a soul in the world who knows she has just a few days maybe to live, at most. Yet, as sure as I'm standing here, I feel that boy will come back to his sister's death bed." In the 1960s and early 1970s, when racial tensions were especially high, a few of Sidney Poitier's best known leading roles were of the upset-the-apple-cart variety whereby his character would be at the epicenter of some kind of racially-charged situation (Guess Who's Coming To Dinner, In The Heat Of The Night, or The Defiant Ones for example). With that established, James Goldstone's Brother John could probably best be described as another in that genre of film, if what we're led to believe about Poitier's character is true. John Kane (Poitier) left his hometown of Hackley, Alabama when he was sixteen, literally disappearing off the face of the Earth. In the following years he has had the uncanny ability to mysteriously show up back in town just prior to the sudden death of a loved one, without anyone having been in contact with him. When his sister is diagnosed with a fatal illness, he appears once again, and the town doctor (Will Geer) and the local sheriff begin to suspect (for very different reasons) that John is not who he says he is. As with most films set in small southern towns, the sheriff (Ramon Bieri) and his deputies are extreme racists who treat the black townsfolk with an almost inhuman contempt. Their fear and hatred of John is compounded when they begin to believe he is an "outside agitator" sent to cause trouble as some kind of union organizer. The elderly local doctor (Will Geer) is the only white character with his head seemingly screwed on straight, and of course his perceptions about who John might be is looked upon as nothing more than senile ramblings. 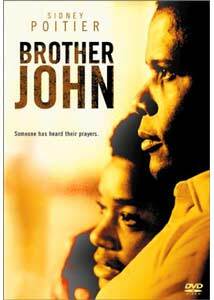 Poitier is really the master of the cold, hard stare in Brother John, and while he may deliver most of his lines in a consistently slow and deliberate style, it is hard not to be drawn to him whenever he is in a scene. Like Peter Cushing, Poitier in his prime just about owns any film when he is onscreen, and there is something about his presence that is difficult to avoid. But Brother John isn't all Poitier's, as Will Geer, probably best remembered as Grandpa Walton, gives an easy and watchable performance as the town doctor. Geer actually gets to uncork with his best chunk of dialogue, late in the film, as he confronts John with his own fears and concerns. Stealing a scene from Poitier is a challenge, but Geer does it here. The story and pacing are slow-moving at times, and a couple of the subplot points meander aimlessly, but Poitier and Geer are well worth watching. Ernest Kinoy's screenplay is cleverly ambiguous, and neatly avoids being too heavy-handed in its message. Image Transfer Review: Given its age, Brother John is presented in a fairly nice-looking 1.85:1 anamorphic widescreen transfer. Colors are a bit on the subdued side, a fact which really serves to date this film. There is quite a bit of grain present, practically constant, but the print itself is devoid of any major blemishes. Audio Transfer Review: A flat English 2-channel stereo track is the only audio option on this disc. Dialogue tends to sound rather tinny at times, but is generally clear. I had to use the subtitles on a couple of occasions because the track had such limited dynamic range that the voices tended to merge with some of the film's extraneous sounds, as well as some of the brasher components of the Quincy Jones score. Extras Review: All we have in the way of extras, and there isn't much, are three Poitier-themed trailers (Brother John, A Raisin in the Sun, To Sir, With Love). The disc is cut into 28 chapters, and features subtitles in English and French. James Goldstone's Brother John is an unusually thought-provoking film, one that doesn't feel the need to have proper and clear-cut explanations for every little thing that occurs along the way. Poitier spends most of his screen time looking wonderfully stoic and all-knowing, and when he speaks it is with the kind of enviable magnetic conviction that made him such a strong screen presence. Some of the elements might seem dated, but the ugliness of racism and the questionable state of world affairs sadly make this one as viable today as it was in 1970.